WASHINGTON — Trains would have to have a minimum of two crew members under rules proposed Monday by U.S. regulators. The move is partly in response to a deadly 2013 crash in which an unattended oil train caught fire and destroyed much of a town in Canada, killing 47 people. The Federal Railroad Administration is also considering allowing railroads that operate with only one engineer to apply for an exception to the proposed two-person crew rule, according to a notice published in the Federal Regulator. The proposal is opposed by the Association of American Railroads, which represents major freight railroads. Many railroads currently use two-person crews, but some industry officials have indicated they may switch to one engineer per train once technology designed to prevent many types of accidents caused by human error becomes operational. Most railroads expect to start using the technology, called positive train control or PTC, between 2018 and 2020. It relies on GPS, wireless radio and computers to monitor train positions and automatically slow or stop trains that are in danger of colliding or derailing. A 2008 law requires PTC technology on all tracks used by passenger trains or trains that haul liquids that turn into toxic gas when exposed to air by Dec. 31, 2015. After it became clear most railroads wouldn’t make that deadline, Congress passed a bill last fall giving railroads another three to five years to complete the task. There is “simply no safety case” for requiring two-person crews, Edward Hamberger, president of the railroad association, said in a statement. Single-person crews are widely and safely used in Europe and other parts of the world, he said. There will be even less need for two-person crews after PTC is operational, he said. PTC “is exactly the kind of safety redundancy through technology for which the (railroad administration) has long advocated,” he said. But Senator Richard Blumenthal, a Democrat, said two-person crews are needed on trains in the same way it’s necessary to have two-pilot crews on planes. “The cost of adding a second, skilled crewmember pales in comparison to the costs of avoidable crashes and collisions,” Blumenthal said. It’s important that the railroad administration impose what safety regulations they can now since railroads “have dragged their feet” on implementing PTC, he said. 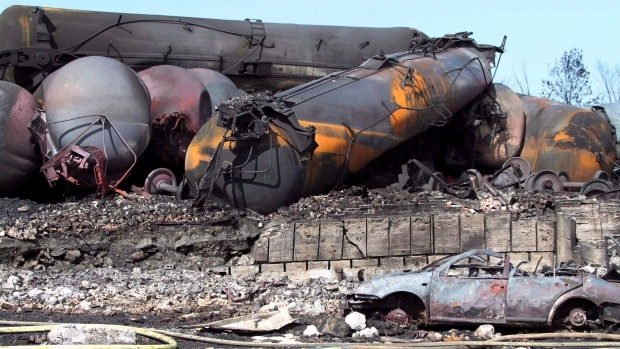 On July 6, 2013, a 74-car freight train hauling crude oil from the Bakken region of North Dakota that had been left unattended came loose and rolled downhill into Lac-Megantic, a Quebec town not far from the U.S. border. The resulting explosions and fire killed 47 people and razed much the downtown area. The train had one engineer, who had gone to a hotel for the night. The three train derailments in the last week in Wisconsin are another reminder that the industry, Congress and states have to move faster in making safety upgrades to rail cars and the tracks on which they move. Part of those improvements also should include better training for local responders to train accidents, better government oversight and more public access to industry records related to safety issues. A rail accident near Alma on Saturday resulted in a spill of 18,000 gallons of ethanol, much of which escaped into the Mississippi River. That accident involved a class of tankers that are being phased out and replaced with tankers that have more safety features. On Sunday in Watertown, a derailment resulted in the spill of crude oil and prompted the evacuation of 35 homes. That accident involved tankers that had been retrofitted with some upgrades. A minor derailment also occurred Wednesday in Watertown, but there was no spill and the cars stayed upright. As the Journal Sentinel noted in a Monday story, the accidents were the latest in a series of rail tanker mishaps across the United States and Canada in recent years that have moved safety issues and preparedness into the spotlight. That includes in Milwaukee, where oil-laden trains move through the heart of the city. She’s right, as is Barrett. While the Senate adopted Baldwin’s reforms on rail safety in its version of the transportation bill, the House did not include those measures in its version. The conference committee should make sure the final bill includes the reforms. And yet there is a serious risk to citizens. More crude oil was spilled in U.S. rail incidents in 2013 than was spilled in the previous 37 years. In 2013 in Quebec, 47 people were killed and 1.5 million gallons of crude oil were spilled in a rail accident involving crude being moved from North Dakota. That train had passed through downtown Milwaukee. The Wisconsin derailments are part of that pattern. Congress and the industry need to pick up the pace on safety.